HE Ambassador Lars Danielsson, hosting Hail and Farewell reception at the Swedish Residense. Leaving people you put into your heart hurts! And although past days were fabulous, with lots of recognition from people we love, admire and respect it was hard to say goodbye but even hard to say so long, auf Wiedersehn! This will be the last blog from the 38th parallel, and I thank all of you who followed me, following my husband these past 2,5 years on our journey in South Korea. Without you all following me, I don’t think I would have kept on writing about our day-to-day life on this peninsula. Looking back the time here past by quickly and honestly everything hasn’t been a dance on roses. However, the human brain is fantastic for when one looks back one remembers the wonderful times……. For me that definitely has been the fabulous people that entered my life. I know! I’m a very fortunate woman for I go back to Sweden having wonderful friendships that will last over time and distance! First of all our fabulous Korean Daughter, Jaeyeon, who has taught us so much about Korea and helped us with everything we encountered. A young and beautiful, very competent woman whom we’ll miss so very much. But also a woman we know we’ll meet and be with again. I can put many other people to my list: The Polish Ambassador Majka and his fabulous wife Zofia, the Swedish Ambassador and all the international colleagues and spouses, my friends from the US who already left for some time ago, miss you but…We’ll meet again. The friends I’m leaving behind; Chi, Joy, Carmen, Pamela, Nam Hwa, Ginger, Helena, Ann, Jun, Seo, Elisabeth, Hedvig, Amber, Jennie, Cecelia, Marianne, Dee, Honey, Angela and many, so many more. Thank you for opening your hearts and giving me your friendship. I’ll cherish it forever and know that with many of you I’ll stay in touch with and WILL see again. The past days have been intense and so have the past weeks been. But it was rewarding to introduce the new Swedish Delegates spouses to Seoul and the American Base. I’m sure they all will contribute to the international environment and enjoy the time on the peninsula. I wish you all a wonderful and giving mission. Without Anders, I wouldn’t have gotten this experience and him too I would like to thank for the freedom he gives me, which I need. But most of all for always giving me positive feedback. It’s not easy to leave, however, it feels good to return back home to Sweden, were we have our children and their spouses and many friends. We are looking forward to catching up with all of them for we’ve missed them! Dear all! Thank you for the interest you have showed in our South Korean adventure. May you have good health, love and prosperity. Waiting for the Change of Command at Knights Field to begin. The official adoption was celebrated! The Swedish ladies a Hail & Farwell luncheon, which was wonderful! Linnea, Gunilla, Lovisa, Wilma and Jan Eldeblad, the Operation Officer. Per and Tina Ljungner with Pascha, the Secretary! Berndt and Marie Grundevik, the HoD of the Swedish Delegation. All say 'Kimchi' except Per Ljungner, who takes the picture. 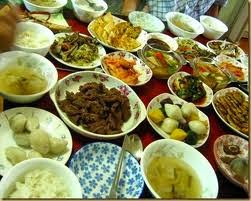 Chuseok, is also called Korea’s annual thanksgiving holiday, and is one of the biggest migration events in modern Korea. Over half of the population visits families and ancestral graves during the holiday. Families living in big cities like Seoul make a massive exodus by car, express bus, train, airplane, and ferry. 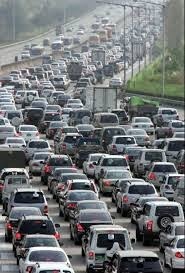 There are long lines of cars leaving Seoul on the days preceding Chuseok, causing massive traffic jams on the freeways and major rural routes. Last year a trip by car from Seoul to Busan, which usually takes about five hours, was reported as taking as long as 20 hours! 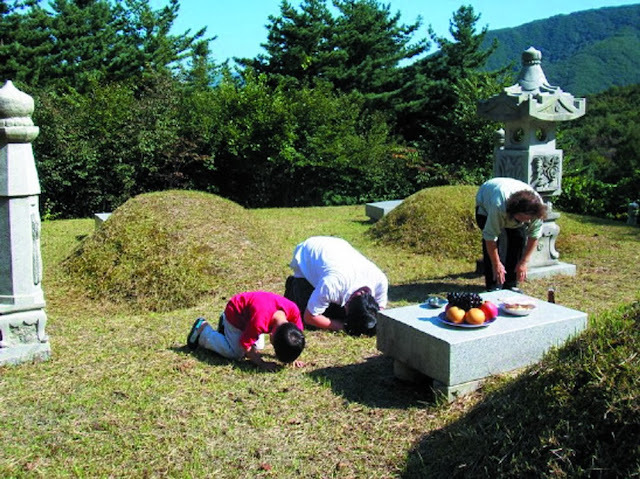 Festive occasions, such as Chuseok, demonstrate the importance of family to Korean society. Family members, usually from the paternal line, get together to prepare food, honor their ancestors, and cherish relatives, both living and deceased. Chuseok is a reminder that families are connected and bonded in the same fortune and ancestors live through the offspring as part of people’s daily lives. These days metropolis Seoul with its 23 million inhabitants is calm and empty……. Entrance 8 to Gangnam subway station. The many, many shops were closed and all the people on there way to the country side and we on our way to Yongsan Base! Are Holiday festivities a lot of work and begin many days before the actual holiday, as women busily prepare food to be put on the ancestral plate for the Chuseok ceremony. 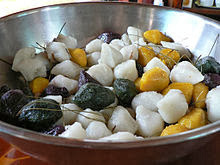 They begin preparations for the festivities weeks in advance by going to the market to buy the newly harvested rice, apples, crisp pears, juju beans, chestnuts, sesame seeds, pine needles, and so on. You might wonder why people need pine needles. 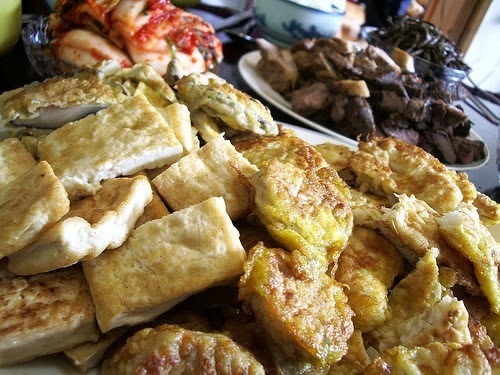 Koreans, like many people from traditional cultures around the world, celebrate holidays with special food. 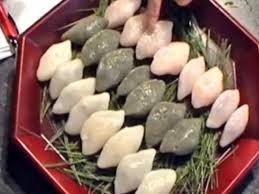 Pine needles are an essential ingredient of the Korean rice cakes called song pyun. These cakes are made with finely ground new rice as the basic dough, which is filled with toasted sesame seeds, chestnuts, or peas sweetened with honey or sugar. Anders and I, together with other guests, were invited to Scholar and Mrs. Ha, Yeon-soon to celebrate Chuseok with a special Chuseok Dinner. Scholar Ha and his fabulous assistant and translator. Leadership representatives for the 8th Army, a division supported by the Foundation in appriciation for everything they have done and do to keep the Armistice for the past 60 years. Below:MG Golden and his wife Jo-Anne in a beautiful Hanbok. Conversations among the guests while enjoying appetisers and pink (:)) Champagne in the tranquility of an oasis in the heart of Seoul. Host and some of his guests ringing in the Chuseok dinner and saying your thanks, for me it became a long ;=) speech for I have a lot to be thankful for! After dinner we were treated to enjoy some music, performed by three talented young women playing the Gayageum. The gayageum is a stringed instrument (geum) of Gaya, an ancient country located in the southern part of the Korean peninsula. According to the History of Three Kingdoms, King Gasil of the Gaya dynasty created the gayageum based on a Chinese instrument. The instrument has twelve strings placed on movable bridges and the right hand makes the sound while the left hand makes the tunes. A big hand for the fabulous culinary team that made a tasty Thanksgiving (Chuseok) dinner. Chuseok (Korean: 추석), is originally known as hangawi (한가위, from archaic Korean for "the great middle (of autumn)"), is a major harvest festival and a three-day holiday in Korea celebrated on the 15th day of the 8th month of the lunar calendar. Like many other harvest festivals, it is held around the Autumn Equinox. As a celebration of the good harvest, Koreans visit their ancestral hometowns and share a feast of Korean traditional food such as songpyeon and rice wines such as sindoju and dongdongju.